Thank you to the responders. The survey is now closed and analysis completed. The survey is available to download in pdf as one document or in sections. The results of the Parish Council’s recent community consultation on roads, traffic and parking, which closed last month, has shown that speeding traffic and pedestrian safety are the top concerns for local residents, with issues over obstructive parking and illegal lorry movements through the village also high on people’s lists. Over 170 survey forms were completed, a return rate of almost 30%, with lots of useful comments and imaginative suggestions covering most locations in the village. 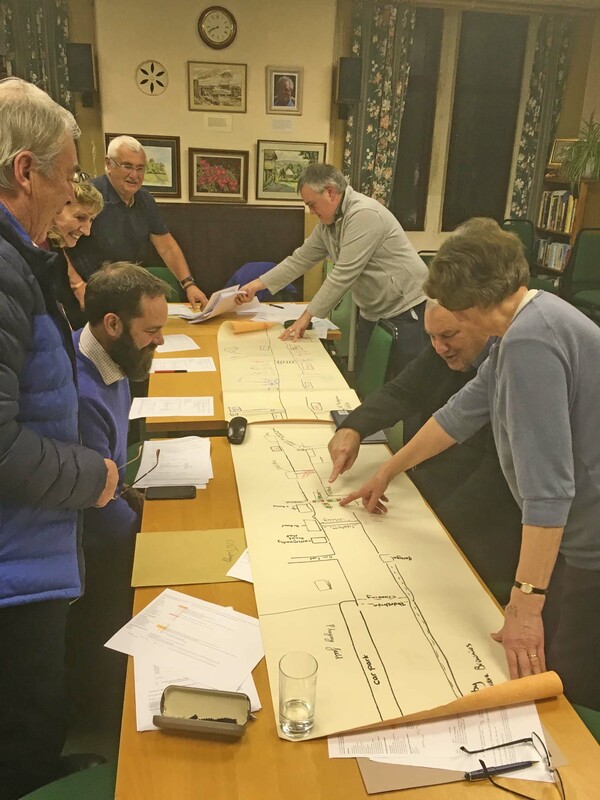 They included a 15ft hand-drawn road map of the village, produced by 1st Youlgrave Brownies on the back of two rolls of wallpaper, pointing out the problem locations and what could be done to make them safer for local people (including traffic lights at Church Corner and pedestrian crossings outside the school and playing fields). The Parish Council thanks everyone for their contributions, which are still being analysed, and a full report summarising the survey findings will shortly be available on the Parish Council section of the village website www.youlgrave.org.uk. Councillors will then take these key messages when they meet local authority officers to identify what can and should be done – all of which will be reported via the Bugle. The survey asked people to rate 12 separate issues relating to roads, traffic and parking in the village in order of importance for them, then from that list select the top three that they considered most pressing (or suggest others not on the list). The top five key issues for respondents, scoring between 88-91% each, were: safety of pedestrians; safe crossing points outside the school; speed of traffic through the village; parking which causes highway obstructions; and parking preventing emergency vehicles accessing properties. The top three priority issues overall were speeding traffic; then safety of pedestrians; and (joint third) obstruction of emergency vehicles and HGVs illegally driving through the village. There were plenty of imaginative solutions, with some people submitting maps and photos. The most popular suggestions, either to address pedestrian or highway safety in the village, were the introduction of a 20mph zone; urgent re-painting of the pedestrian walkways; and action to stop dangerous parking on Church Corner. Other ideas included providing more parking for residents, with various locations for new car parks suggested. There was evident concern for both pedestrians and drivers at the well-known ‘pinch points’ between the Bull’s Head and the Post Office; and outside the Garage by the Old Stonemason’s Cottage/Scout & Community Youth Hall. There was a little support for short stay parking outside the village shops and the introduction of a residents’ permit system for parking; but other possible solutions, such as yellow lines in the centre of the village, were actually ruled out by some respondents for their visual and urbanising impact. Other suggestions, such as extending car parking on the Alport Lane playing fields, are unfortunately impractical – in this case because of the layout of the sports pitches and the likely resistance from the owners Field in Trust (the Parish Council only manage the site). However, the survey revealed clear and widespread concern over the safety of pedestrians in the village, whatever their age; and undoubtedly the most creative contribution was provided by 1st Youlgrave Brownies. 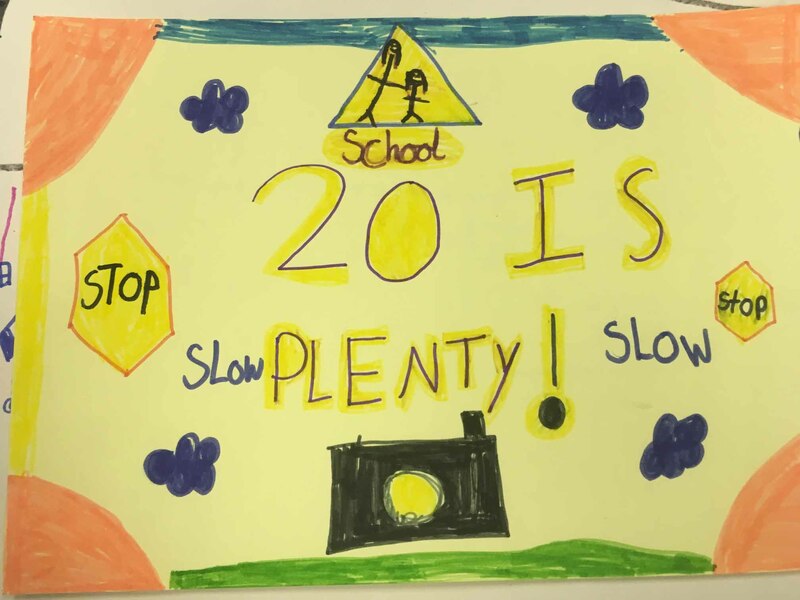 In addition to their 15ft map of the village, they also produced hand-drawn road safety posters, which are being put up around the village. In return, Parish Council Chairman Graham Elliott presented all the girls with flashing road safety armbands to ensure that they can be seen in the dark. Already the Peak District National Park Authority has been in touch with the Parish Council to ask about the survey results. The next step is likely to be a walk through the village with both the Peak Park and highway officers from Derbyshire County Council, looking at specific problem locations and trying to come up with realistic solutions. Derbyshire Dales MP Sir Patrick McLoughlin has also written to the Parish Council expressing his support for action. More news on this to follow in due course. Thank you again to everyone for your responses.